Flowering from summer to mid autumn - and sometimes beyond, these easy to grow plants will provide lashing of colour in the garden. The flowers last well after being cut too, and look spectacular with oranges, yellows, lime green and rich purple. Gorgeous in flower beds and borders it is also superb cut flower with vase life as long as 7 to 10 days. 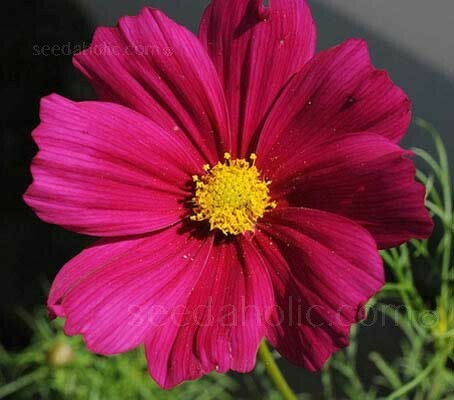 Cosmos Dazzler grows to a height of around 90 to 120cm (36 to 48in) with a spread of around 35cm (14in). Dazzler is an exceptional annual flower for mixed beds and borders, cutting and cottage gardens, and mass planting in naturalised areas. 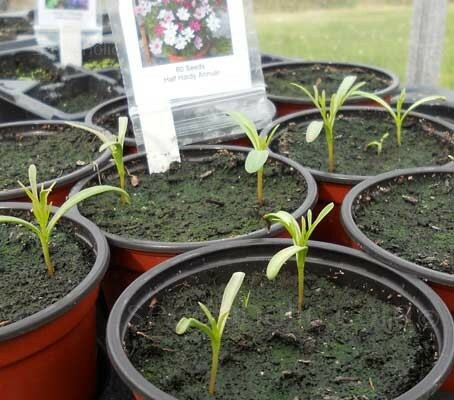 Sow indoors in early spring 3 to 4 weeks before planting outside, alternatively, the seed can also be sown directly where they are to flower in mid to late spring. Keep soil moderately moist during germination. Use well drained soil and cover to a depth of 3mm (1/8in). When large enough to handle, transplant the seedlings into small pots to grow on. Acclimatise to outdoor conditions for 10 to 15 days before planting out after all risk of frost 15cm (6in) apart. Prepare the ground well and rake to a fine tilth. If sowing more than one annual in the same bed, mark the sowing areas with a ring of sand and label. Sow 1mm (1/18th in) deep in rows 30cm (12in) apart. Sow seed sparingly or they will choke out other seedlings. The seedlings will appear in rows approx 6 to 8 weeks after planting and can be easily told from nearby weed seedlings. Thin the seedlings out so they are finally 30cm (12in) apart. Carefully replant thinned plants. When the seedlings have three pairs of leaves, pinch out the tips, leaving at least one pair of leaves. Only water in an extended drought and do not apply large doses of fertiliser as flowering will be suppressed. Stake the taller varieties with a single or tripod of canes and some twine. Cosmos foliage is finely-cut into threadlike segments. When flowering, the taller varieties may become top heavy. 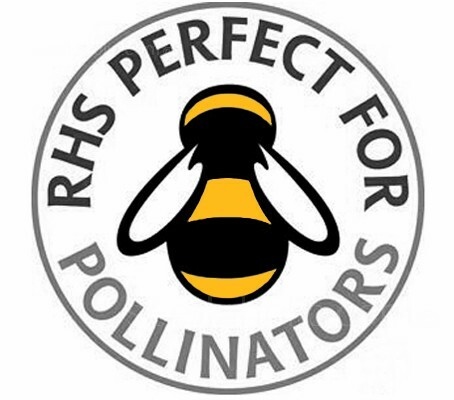 This problem is alleviated when grown in groups, as the bi-pinnate leaves interlock, and the colony supports itself. Deadhead to prolong flowering and encourage new flower buds. At the season's end, don't be too quick to pull up withering cosmos plants. Birds (particularly gold finches) love to snack on their seedheads in autumn, and the seeds that they miss may drop to the ground and reward you the next year by sprouting into a whole new crop. Cosmos is a cut-and-come-again bloomer, meaning that the sooner you cut the blooms, the quicker new buds will pop up to replace them. The blooms appear so profusely that you'll still have plenty of colour in the garden after you've picked your flowers. If you sear the stem end in boiling water for twenty seconds they will last a week in water. Cottage/Informal Gardens, Flowers Borders and Beds. Container Planting. When Spanish explorers were looking for riches in Mexico to send back to Spain, one of the treasures they found was the golden cosmos flower, Cosmos sulphureus. In 1789 the flower made its way to England with the wife of the Spanish ambassador to Spain. Half a century lapsed before the golden cosmos reached the US indirectly from England and Spain and directly via Mexico. Horticulturists are always trying to improve on Mother Nature and today many cultivars of Cosmos sulphureus are available. Depending on variety they will grow anywhere from 30cm to 200cm (1 to 7ft) in height. Cosmos have been reassuring gardeners ever since the 1930s, when breeders first coaxed cosmos to bloom earlier than the native Mexican species, the flower-growing public has been hooked. Like many of our warm weather annuals such as marigolds, Cosmos originated in Mexico and South America. Spanish priests grew cosmos in their mission gardens in Mexico. The evenly placed petals led them to christen the flower Cosmos, derived from the Greek kosmos, the word for harmony or ordered, or balanced universe. From this we also get the common name of 'The Mexican Aster'. The species name is from the Latin bipinnatus meaning 'twice-pinnate' The botanical epithet is from the Latin pinnatus meaning 'with leaflets arranged in opposite pairs'. Lean, well drained, sandy soils.